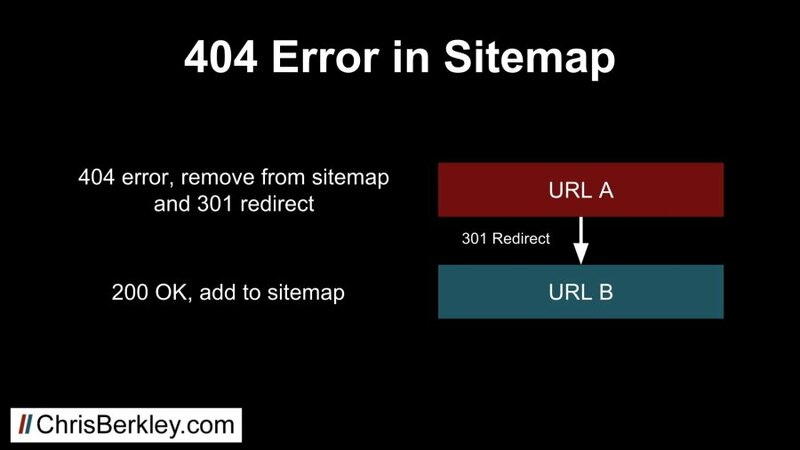 XML Sitemaps are critical to help search engines crawl websites, but I frequently see clients with critical errors in their XML sitemaps. That’s a problem because search engines may ignore sitemaps if they repeatedly encounter URL errors when crawling them. 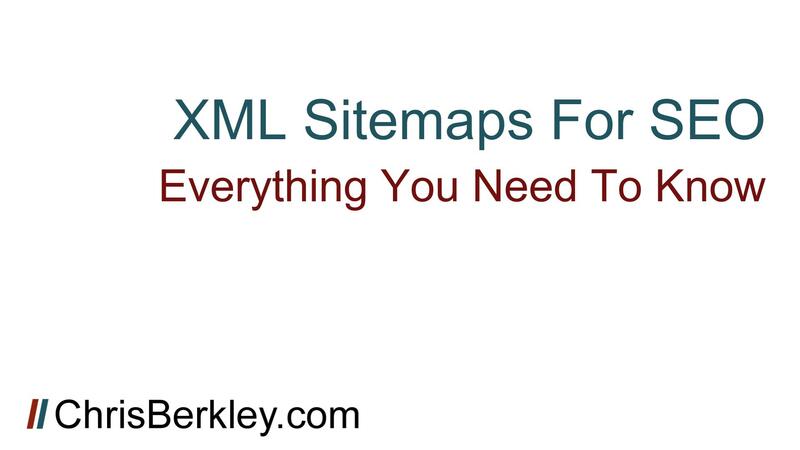 An XML Sitemap is an XML file that contains a structured list of URLs that helps search engines crawl websites. It’s designed explicitly for search engines – not humans – and acts as a supplement. Whereas web crawlers like Googlebot will crawl sites and follow links to find pages, the XML sitemap can act as a safety net to help Googlebot find pages that aren’t easily accessed by crawling a site (typically called island pages, if there are no links built to them). Where Do XML Sitemaps Live? The XML sitemap lives in the root folder, immediately after the domain, and often follows a naming convention such as domain.com/sitemap.xml. A Sitemap declaration should also be placed in the robots.txt file so that Google can easily discover it when it crawls the robots.txt file. What URLs Should Be Included In An XML Sitemap? Only 200 OK URLs: no 404s, 301s, etc. Sitemap URLs should return clean 200 status codes. That means no 301 or 302 redirects, 404 errors, 410 errors or otherwise. Google won’t index pages that return 404 errors, and if Googlebot does encounter a 301 redirect, it will typically follow it and find the destination URL, then index that. If you have 404 errors, first ask why: was a page’s URL changed? If so, consider redirecting that URL by locating the new URL. Take that new URL and make sure that is included in the sitemap. 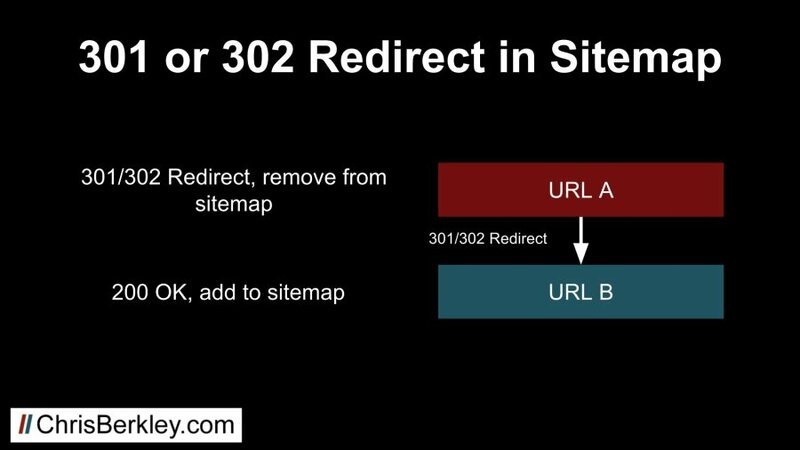 If there are 301s or 302s, follow them to the destination URL (which should be a 200) and replace the redirected URL in the sitemap. If a page has a noindex tag, then it’s clearly not intended to be indexed, so it’s a moot point to include it in the XML sitemap. Similarly, if a page is blocked from being crawled with robots.txt, those URLs should not be included either. If a page in the sitemap has a canonical tag that points to another page, then remove that URL and replace it with the canonicalized one. Does Every Clean 200 Status URL Need To Be Included? In short, no. Especially on very large sites, it may make sense to prioritize the most important pages and include those in the XML Sitemap. Lower priority, less important pages may be omitted. Just because a page is not included in the XML sitemap does not mean it won’t get crawled and indexed. An XML sitemap can only contain 50,000 URLs or reach a file size of 10MB. Sitemaps that exceed this limit may get partially crawled or ignored completely. If a site has more than 50,000 URLs, you’ll need to create multiple sitemaps. These additional sitemaps may be located using a sitemap index file. It’s basically a sitemap that has other sitemaps linked inside it. Instead of including multiple sitemaps in the robots.txt file, only the index file needs to be included. If there ARE too many URLs to fit into one sitemap, URLs should be carefully and methodically structured in hierarchical sitemaps. In other words, group site sections or subfolders in the same sitemap so that Google can get a better understanding of how URLs interrelate. Is this required? No, but it makes sense to be strategic. In addition to creating sitemaps for pages, sitemaps can (and should) be created for other media types including images, videos, etc. Depending on the CMS and how it’s configured, the sitemap may be dynamic, meaning it will automatically update to include new URLs. If it’s configured correctly, it will exclude all the aforementioned URLs that shouldn’t be included. Unfortunately, dynamic sitemaps do not always operate that way. 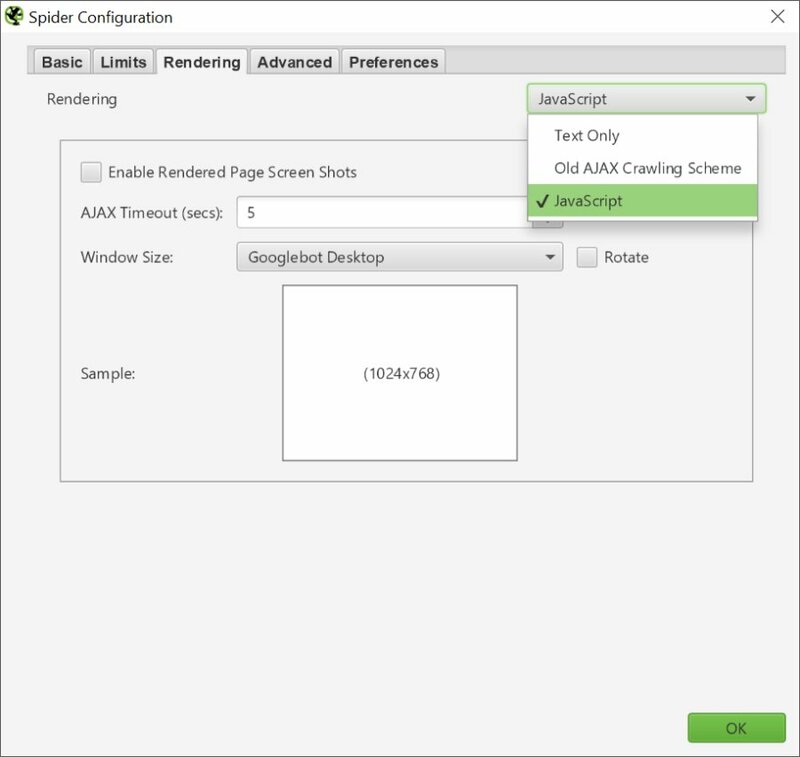 The alternative is a static sitemap, which can easily be created using the Screaming Frog SEO spider. Static sitemaps offer greater control over what URLs are included, but do not automatically update to include new URLs. In some cases I’ve recommended clients utilize static sitemaps if a dynamic sitemap cannot be configured to meet sitemap criteria. When that happens, I set a reminder to provide an updated sitemap, typically on a quarterly basis, or more often if new pages are frequently added to the site. Once an XML sitemap has been created and uploaded, it should always be submitted to Google Search Console and Bing Webmaster Tools to ensure crawlers can access it (in addition to the robots.txt declaration). Navigate to Crawl > Sitemaps and at the top right you’ll see an option to Add/Test Sitemap. Click that and you can submit your sitemap’s URL to be crawled. From the main dashboard, navigate down to the sitemaps section and click “Submit a Sitemap” at the bottom right. There you can enter your sitemap’s URL. Google Analytics filters for IP addresses can exclude traffic and conversions from your home/office before it even gets into Google Analytics. Google Analytics opt-out plugins for Chrome, Firefox, etc. have the same effect as IP filters. If a single person fills the same form three times during their session, that will be recorded as three Events. However, it will only be recorded as one Goal Conversion. This is just how Google Analytics works. If you have your site setup to redirect to a thank you page after the form is submitted, this tutorial will not work for you – you need to set up Goal Conversions differently. If you are not using GTM to track submissions, this tutorial will not work for you. Similarly, if you have a mix of GA and GTM, I can’t guarantee how functional this will be for you. Assuming you’ve double checked your setup and followed the directions carefully, with no typos, let’s start with Google Tag Manager and find out if the tags are firing. Log into GTM, navigate to the top right corner and click Preview. We’re going to use GTM’s Debug mode to see if the event is firing, and make sure information is being sent to the Data Layer. Go to a page on your site with the Contact Form that you’ve setup tracking for, then do a hard refresh (Shift + F5 in Chrome) to ignore cached content and get a fresh page load. If you don’t see either of these, there’s an issue with one of those tags, and you should go back and make sure they’re set to fire correctly. Next, fill out and submit the form. At left you should see a new event, wpcf7successfulsubmit. Clicking on it will reveal details about what tags were fired on this event. You should see the Contact Form Submission tag listed (see below). Now go to the rightmost option in the row at the top of the pane – click on Data Layer. You should see CF7formID listed in the Data Layer, and it should have an actual form ID in it (in this case, 1192). This information was pushed into the Data Layer using the wpcf7mailsent tag. If you don’t see it, or it says undefined, go back and look at your wpcf7mailsent tag – it’s possible your tag has an issue. Next, clicking on the Variables tab will show you what Variables were captured, and you should see a Data Layer Variable named CF7-formID. If you see the form ID listed in the Data Layer tab, but not the Variables tab, then it’s likely your custom CF7-formID Variable has an issue and you should take a second look. If you run through all this troubleshooting and everything checks out, then we need to move into Google Analytics to keep evaluating the different parts of the process. It doesn’t mean your GTM setup is 100% working, but does start to narrow down the number of areas in which things went wrong. Log into GA and go to the Real-Time > Events report. Fill out and submit your form again, then wait a few seconds. The GA event should be logged with the Category & Action you included in the Contact Form Submission GTM tag (see below). 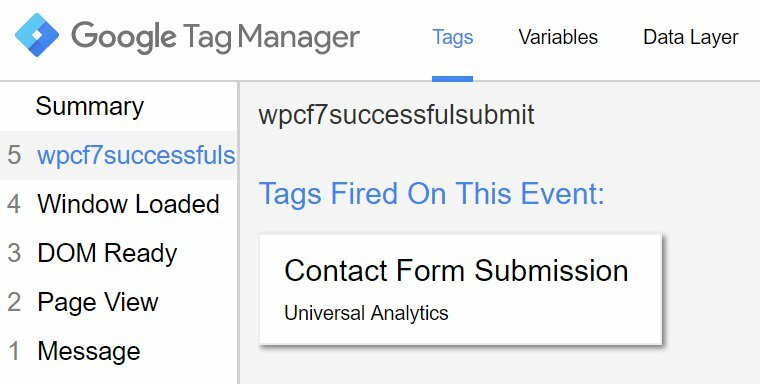 If it isn’t, then first look at your Contact Form 7 Trigger and make sure it’s set to fire on wpcf7successfulsubmit. By clicking on the Event Category, GA will also show you the Event Label, which we set up to be the form ID. If you don’t see this, make sure your Contact Form Submission GTM tag has the Event Label defined correctly as the CF7-formID GTM Variable. Missing an Event Label will affect Goal conversion tracking if you have it set up to track a specific form. If that all checks out, go look at the Real Time > Goal Conversion report. You should see your Goal Conversion appear there also. 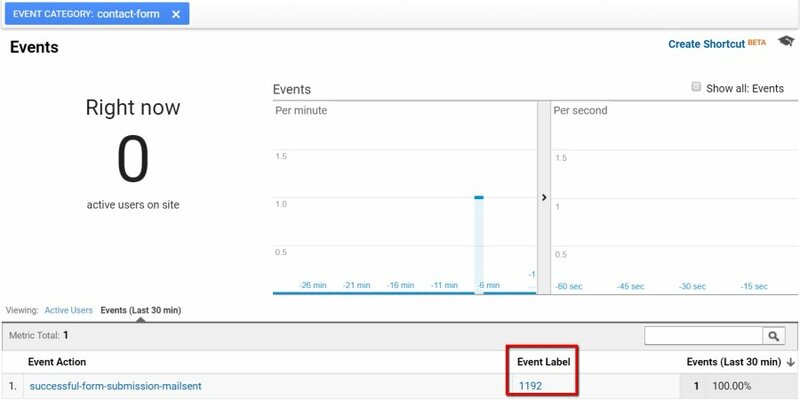 If it doesn’t, examine your Goal Conversion setup in Google Analytics to make sure you’re tracking the correct Event Category, Action and Label. I’m excited to announce that I’ll be speaking at WordCamp Cincinnati on November 12th! WordCamp Cincinnati is a two-day conference for WordPress experts and enthusiasts to come together and listen to presenters talk about innovative ways to use WordPress. My session will focus on Integrating WordPress & YouTube for Better SEO. Working with dozens of clients on WordPress & YouTube (including myself) I’ve gained a lot of experience into optimizing & integrating the two together in order to maximize organic visibility and market share in search results. My presentation will give attendees actionable steps that they can put into practice in order to take their WordPress & YouTube content to the next level. 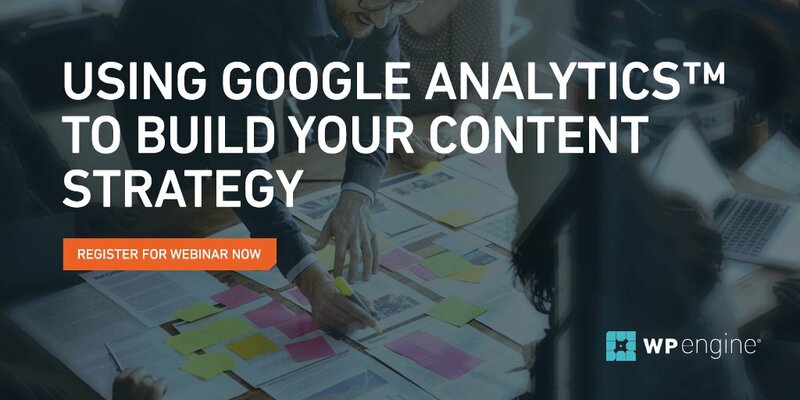 In October, I’m excited to announce I’ll be co-hosting a webinar about Using Google Analytics to Build Content Strategy. In my role as Sr. Account Manager at Seer Interactive, and as an independent consultant, I use Google Analytics daily to gain insights about the performance of existing content, then take those learnings and apply them to future content to drive similar results. The good folks at WP Engine invited me to host this webinar based on my knowledge of Google Analytics, and also my experience working with WordPress, on client sites and also on my own. WP Engine offers managed WordPress hosting and we’ll be discussing their newly released Content Performance tool, which is a built-in reporting dashboard with WordPress-specific functionality. Length: It’s a 30 minute webinar designed to be as actionable as possible. How to apply the data to improve your content strategy? 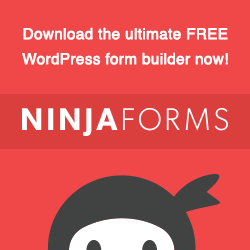 You can sign up for free on the WP Engine site! Wistia is a great platform for hosting videos on your site with tons of functionality including the ability to embed videos on pages and optimize them using built-in calls-to-action and pop-ups. Recently I encountered a scenario where I wanted to find every website page that had a Wistia video on it. Going into Wistia’s back end revealed that the client had ~200 videos, but I had no idea where they were actually placed on the site, and wanted to ensure they were being used to full capacity. With YouTube, you can simply run a Screaming Frog crawl and do a custom extraction to pull out all the embed URLs. From there you can determine which video is embedded based on that URL. However, the way Wistia embeds videos is not conducive to identifying which video is where, based on an embed URL. I couldn’t find any distinguishing characteristics that would help me identify which video was which. How can such an advanced video platform be so incredibly difficult? 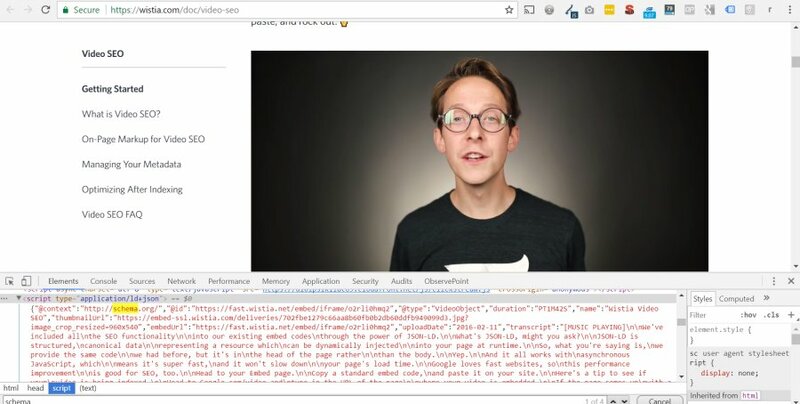 Using Inspect Element is the only way to really see what Wistia content is on the page. 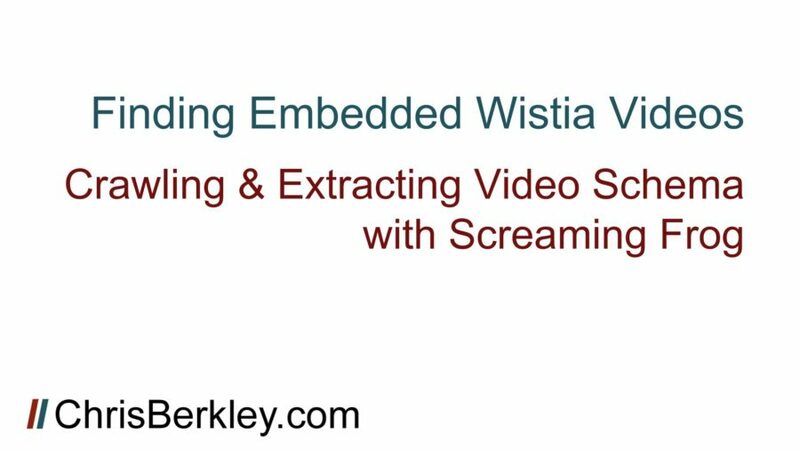 Doing that will show you much more information, including the fact that Wistia automatically adds and embeds video Schema when you embed a video. This is awesome and saves a ton of work over manually adding Schema like you have to do with YouTube videos. The video Schema contains critical fields like the video’s name and description. These are unique identifying factors that we can use to determine which video is placed where, but how can it be done at scale when we don’t even know which pages have videos and which don’t? This will ensure you grab the entire block of Schema, which can be manipulated in Excel later to separate different fields into individual columns, etc. Then set Screaming Frog to list mode (Mode > List) and test the crawl with a page that you know has a Wistia video on it. By going into the Custom Extraction report, you should see your Schema appear in the Extraction column. If not, go back and make sure you’ve configured Screaming Frog correctly. Schema can be crawled and extracted with Screaming Frog, but it’s a memory hog so larger sites might be a no-go. Questions? Tweet at me: @BerkleyBikes or comment here! 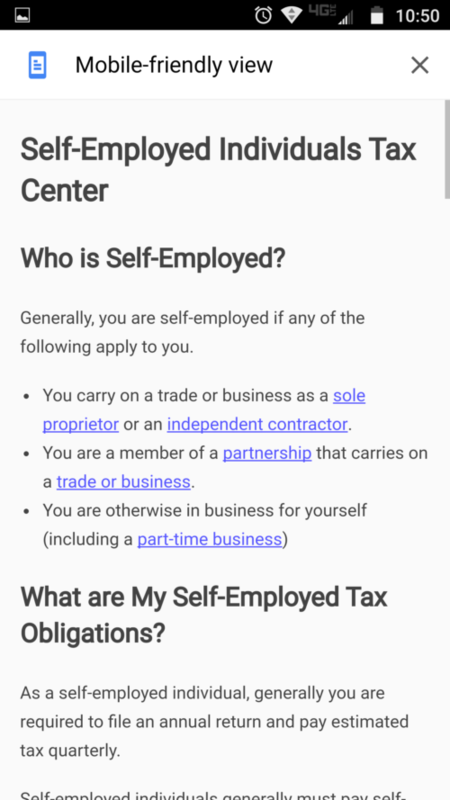 A few weeks ago Google rolled out a post feature for its My Business Listings. 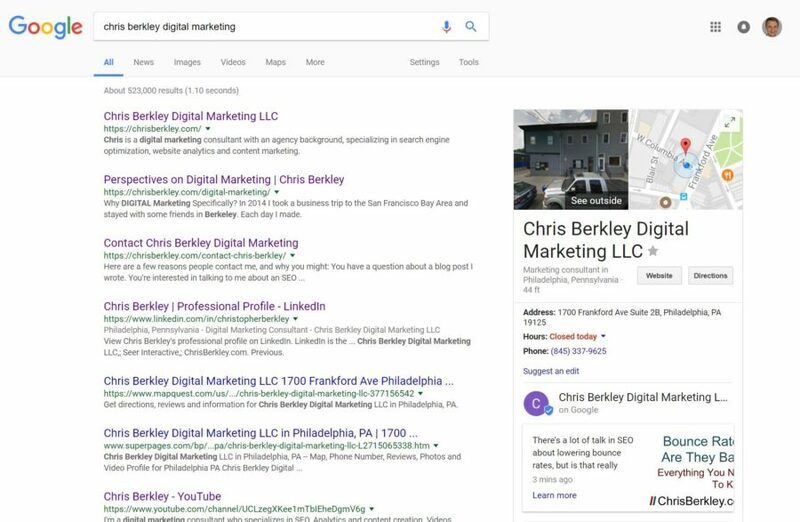 Now you can create Facebook-like posts in the back end of the Google My business interface, that will display an image, description and website link in a box below your Google My Business listing’s knowledge graph. First I’ll show you how to create & optimize these, then I’ll discuss where I foresee them being most useful. First log into your Google My Business platform and select the location you want to create a post for (if you have more than one). So far posts have to be manually created for each location, so it’s not easy to roll them out to hundreds of listings. The post you create will only show up for the listing you create it for. Once you’ve selected your location, click on the “Posts” option on the left nav and you’ll see a box in which you can write a post. You’ll also see previous posts located underneath (this particular post is expired, I’m not sure how long they stay there for). Once you click into the post editor, it’ll look like this. The interface is admittedly clunky. If you click on that big gray box, it’ll let you upload a photo and prompt you to crop it into a rectangular shape. (You would think the Photo Guidelines linked at the bottom would provide criteria for sizing, aspect ratio, etc. It does not.) Ideally your image should be engaging and grab attention. You may opt to include text in the image – this reminds me a lot of a Google AdWords Display ad, which may hint at the future of this functionality. Then you can add a description – you have between 100-300 words. There are really two types of posts – events and non-events. Non-event posts last a week, while event posts will prompt you to enter start/end dates and will stay up for the entire duration of the event. You can also add one of several preset call-to-action buttons for people to click on (I’ve chosen ‘Learn More’) and add a URL. I highly recommend tagging this URL, just like you should tag the landing page URLs in your GMB listings. Otherwise, it’ll come through as organic, but you may not know whether it was from a normal SERP or the post itself. You can use Google’s URL builder – be sure to tag the medium as organic (these URLs should only be accessible from an organic search). The source is up to you, but I’ve been using g-local-post as my source (to differentiate from g-local as my source in the listing URLs themselves). Then you can preview your post and if it looks good, publish it. Now you’ll see your post as a small box at the bottom of your branded knowledge graph. Despite the fact that I’ve done everything Google requested, the image is cut off and the description cut short. Hopefully this product evolves a bit and remedies some of those issues. You might think “I wonder if they look better on mobile?” – the answer is no (see below). If there’s more than one post, you do see a carousel (whereas desktop only displays one post at a time). On mobile, Google does allow you to click on a tab and see the posts by themselves, but who’s realistically going to do that? The GMB Post format and interface is clunky. The images almost never show up as intended, making them ineffective. Their usefulness is also limited by where they appear. The only time these posts will show up is in a knowledge graph, which typically indicates a branded search took place. The chance they’d show up for a non-branded search is very limited, so they’re not much use to drive new organic traffic. If anything, they may steal traffic away from the GMB listings themselves, so be aware of that. While my examples used blog posts, this is probably poor usage. These types of posts would be much better suited to location-specific events that someone searching for a particular location would want to know about. It’s sort of like free display ads – I wouldn’t be surprised if Google eventually monetizes this with advertising, the way they added and monetized the local map pack with ads. Questions? Comments? Tweet at me (@BerkleyBikes) or drop a comment here! 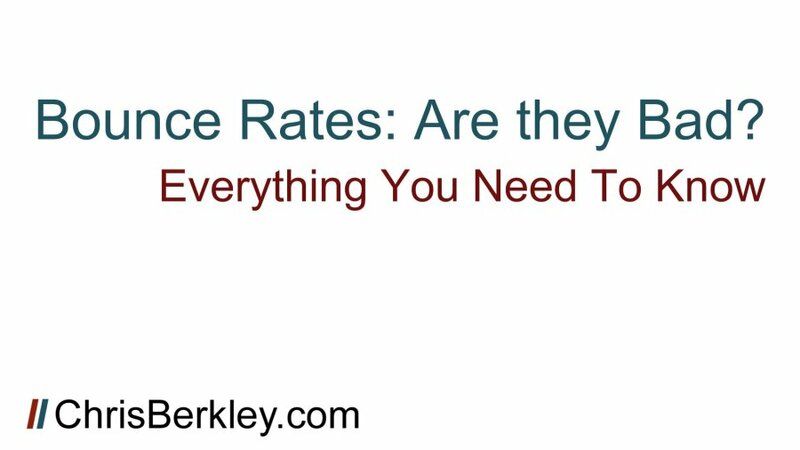 Bounce Rates: Are They Bad? Let’s talk about bounce rates. The reason we’re talking about them is because they’re largely misunderstood and less scrupulous (less informed?) marketers than myself routinely make claims about lowering bounce rate…as if that’s universally a positive thing. It may be. Or it might not matter. Read on and I’ll explain why. Before we really get into it, let’s recap what bounce rate is. Bounce rate is the percentage of visitors who have one single Google Analytics hit during their site session, before leaving. Very often, it is incorrectly stated that bounce rate is the percentage of people who view one page before leaving, but that’s not necessarily true. A pageview is a type of hit, but not all hits are pageviews (I’ll explain why in a few paragraphs). Bounce rate is one of the metrics in the Google Analytics default report (the first screen you see when you login). I absolutely revile this report. I know its intentions are good, but I’ve seen far too many reports recapping these numbers and nothing else (to be fair, there was a time when a less-worldly version of myself created said reports). The default report is especially worthless because it looks at bounce rate across the entire site and that’s an utterly stupid way to use that metric. Different types of pages or marketing channels will have vastly different bounce rates and you shouldn’t roll them into one site-wide number. The red/green colored text leads you to believe that a lower bounce rate is good and a higher bounce rate is bad, but consider this: What if someone lands on a location page where they get directions or a phone number? In that scenario, they might be considered a bounce, but in reality, they completed an action that takes them one step closer to being a customer. Or, what if the page is lead-gen oriented, contains a form and gives visitors all the information they came for, without the need to click on another page? That may also be considered a bounce, but if the visitor converts into a lead, who cares? What if the page has a baking recipe on it, and visitors spend 20+ minutes with the page open while they use that recipe, then close the browser when they’re done? Possibly still a bounce. I could go on, but I won’t because I’ve made my point – there are plenty of scenarios where bounces are not something to be concerned about. When Is Bounce Rate Bad? If your site makes money from ad revenue, bounce rate could certainly be an issue. Most ad-based sites rely on multiple pageviews per session so they can cycle more ads and increase the likelihood one one of them is relevant and gets clicked. Ever wonder why “22 Photos of Cats in Boxes” takes 24 pages to finish reading? Ad revenue, that’s why. Similarly, if you have a high bounce rate on gateway pages that are supposed to funnel traffic to other pages on the site, that could be an issue. Even then, it’s highly dependent on the site/design/business model/industry. In other words, yes, a high bounce can be a problem, but should be evaluated on a case-by-case basis and with plenty of scrutiny. Looking at a site-wide bounce rate is a complete waste of time, and an exercise in futility. Earlier I said bounce rate is based on the number of hits and not pageviews. As noted, pageviews are a type of hit, but there are also many others including form submissions, click to call, click to get directions, video plays, etc – These actions can be set up as interaction hits or non-interaction hits. An interaction hit will affect the bounce rate. A person who views one page and fills out a contact form will count as two hits – not a bounce. A non-interaction hit does not affect the bounce rate. You might want to track video views, but if they’re less of a priority than form fills, you can track them as non-interaction hits. A person who views one page and watches a video that’s configured as a non-interaction hit, will still count as a bounce. The choice between interaction and non-interaction hits gives you the flexibility to adjust the way bounce rate is calculated, for better data. But that’s not the end of it by any means. So a single pageview is OK as long as there’s also an interaction hit, but still bad if there isn’t, right? Well…no. That bounce visit could still serve an important role in the customer’s path to conversion. It’s common for marketers to analyze and report on data using Google Analytics’ Last Non-Direct Click attribution model (guilty as charged) and when that happens, it’s easy to over-emphasize bounce rate. Let me back up again. 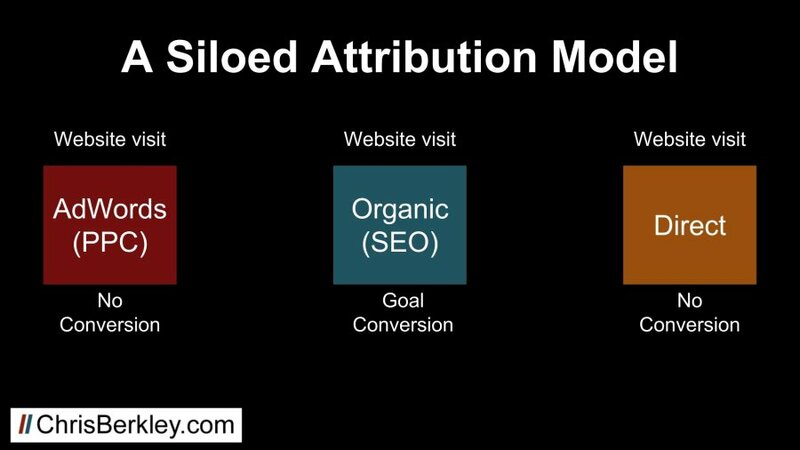 Google Analytics lets you apply several different attribution models in order to give attribution (credit) to different channels based on their position in the conversion path. 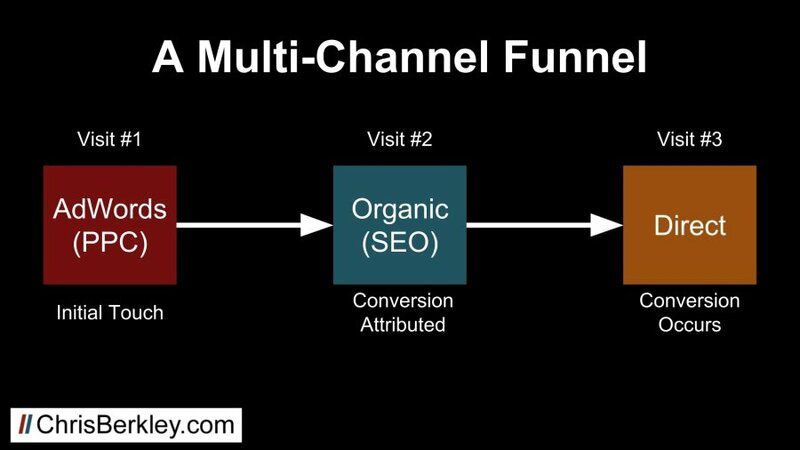 You can read more about it here, but the default attribution model is last non-direct click, where the last channel before the conversion receives attribution, unless that channel is direct. We know a prospective customer may visit a website multiple times before converting. We also know that customer may arrive at the site via a number of different digital channels. The diagram below shows a three touch conversion path (AdWords > SEO > Direct). While the initial touch was an Adwords ad click, organic will get attributed the conversion because it’s the last non-direct touchpoint. But without careful analysis (and in part due to the last non-direct click attribution model), these three sessions are likely to be viewed from a siloed perspective, without making the connection they all played an important role. Without looking at the full conversion path, this is going to look great for SEO and not so great for PPC efforts. An SEO-specific report is likely to ignore both the paid search and direct sessions that contributed to the conversion. A report specific to paid search may look at the ad spend as ineffective, since it didn’t convert in that session. 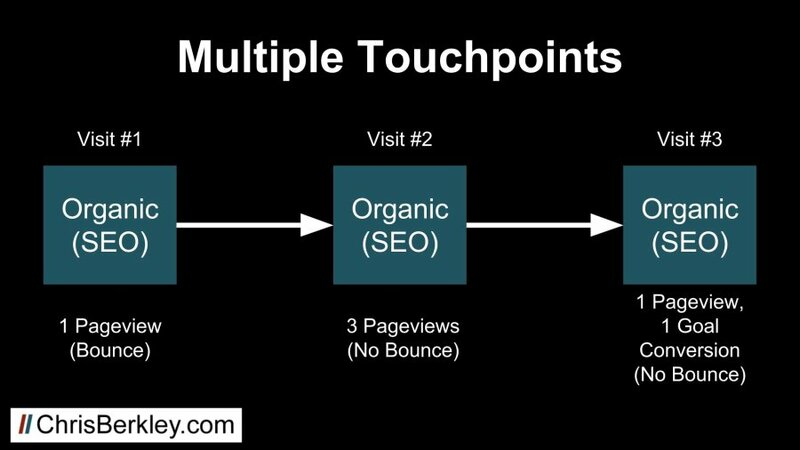 I realize including multiple channels may have you thoroughly confused, so let’s simplify it further and say all three visits were organic. This way there’s no question that organic should be attributed the conversion. Let’s also assign an arbitrary number of pageviews to each visit, as seen below. There’s no question about which channel gets the conversion…but it doesn’t change the fact that if analysis is being done at the session-level, these three sessions will not be linked together. The first visit will be considered a problem because it was a bounce, while the last visit will be celebrated because it resulted in the conversion. Realistically, the last visit may not have happened if it wasn’t preceded by the initial bounce. 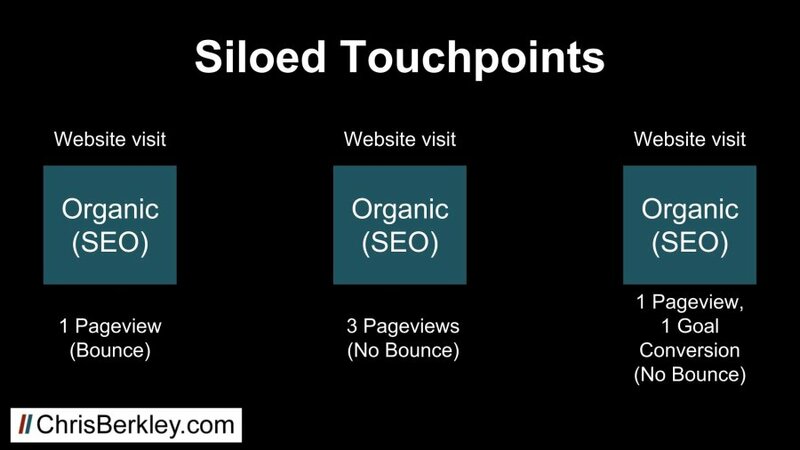 The middle visit is somewhere in between: not as good as a visit that converts, but at least it’s not a bounce. It’s possible that all three of these visits played a critical role in the customer journey and discrediting any one of them could result in lost conversions. Similarly, spending time trying to lower bounce rates may be futile if those bounces play a bigger role in a longer path to conversion. Bounce rate is incredibly complex and boiling it down to good or bad is very, very difficult. As an SEO consultant, I rarely ever focus on bounce rate because I understand this complexity. Bounce rate is not something I report on, and lowering it is never an objective of my campaigns. SEO projects should be focused on driving relevant traffic that eventually converts into leads, sales and customers, not driving down bounce rates in order to achieve a perceived industry standard or arbitrary metric. 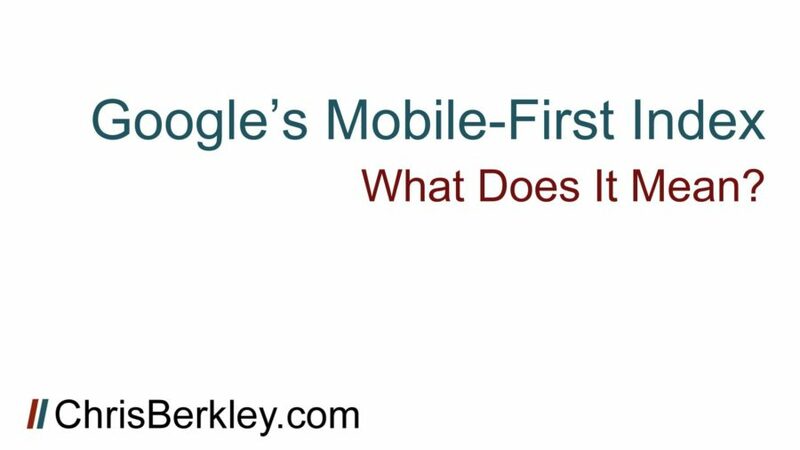 Google’s Mobile-First Algorithm: What Does It Mean? Before you read any of this, understand that what’s in this post is not guaranteed to be fact. Much of this information is anecdotal based on phenomena I’ve encountered. In my defense, almost anything you read about this topic is somewhat anecdotal – none of us have a picture perfect idea of how Google’s internal processes work. I welcome and encourage you to leave questions and comments. 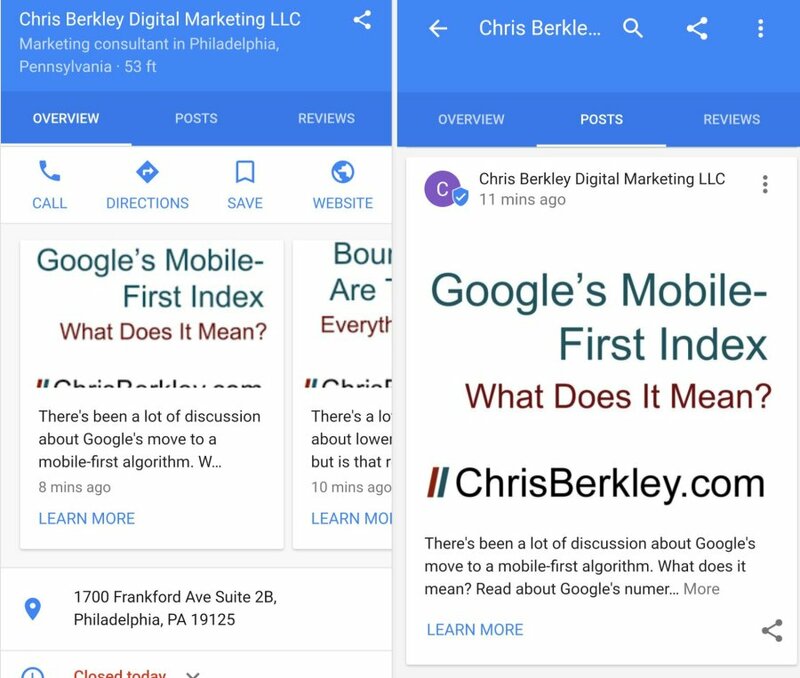 In November of 2016 Google’s Webmaster Blog announced the long term goal of moving toward a mobile-first search index. This could have a fundamental impact on search rankings, although it remains to be seen whether it’ll truly be impactful, or go the way of the first mobile-friendly algorithm update, which had minimal impact overall. First, let’s do a basic recap Google’s process for crawling and indexing web pages. While we don’t know the intimate details, we at least have a high level understanding of how the process works. Google’s web crawlers (bots) periodically crawl websites and index the content. They follow links to find additional pages and take into account on-page optimization like titles, H headings, body content, images, video, etc. There are two versions of Googlebot – one for desktop and one for mobile. Similarly, there are two different indexes (also desktop & mobile). At present, the desktop index is the primary index to determine where a page will rank in search results. Traditionally, desktop has been the primary traffic source and was responsible for the majority of searches. Now Google is claiming the split has shifted in favor of mobile. Exactly how Google rectified differences between the two indices is not well known. For example, a page that provides a phenomenal desktop experience could easily provide a very poor mobile experience if it’s not responsive. When that’s the case, what does Google do? Does it index and rank the page in desktop search results, but not on mobile? Doing so would provide a very inconsistent searching experience across devices. Imagine if you ran a search on your phone then replicated it later on desktop and you were presented with a completely different set of results? That would be confusing, right? It has been my experience that even though the mobile index is not the primary, it does directly influence desktop rankings. Several months after going responsive, an education client I worked with saw big increases in desktop rankings after the second mobile algorithm update in 2016 (in addition to big increases on mobile). This backs the theory that in an attempt to present a consistent user experience, Google links the two indices, and mobile, the “secondary” algorithm could have a significant impact on desktop. In effect, we believed their non-responsive site was limited on desktop because their mobile experience was poor. When the algorithm rolled out, we saw big increases on mobile and in order to preserve the cross-device user experience, that necessitated big increases on desktop too. It has also been my experience that a poor mobile experience does not automatically disqualify a page from ranking well on mobile OR desktop, if the page is sufficiently relevant or influential. 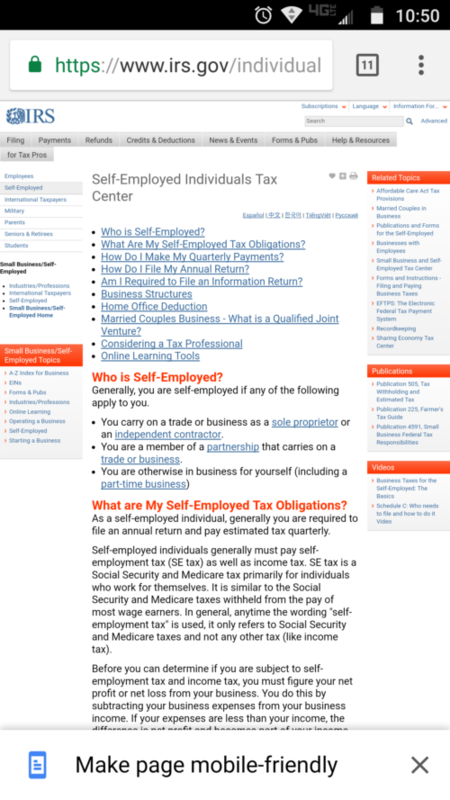 Large swathes of IRS.gov are not mobile responsive but continue to rank well on both desktop and mobile. They have to – it’s a critical government website that millions of people rely on. Despite the poor user experience, Google can’t penalize these pages too much. It would create serious issues if they did and searchers couldn’t find them. So Google continues to rank them, which may be a function of how frequently they’re cited on other sites (have many backlinks they have). How does Google rectify the fact that it’s ranking non-responsive pages? In September 2016, Google quietly updated Chrome with a feature that gave users the option to “make a page mobile-friendly.” Perhaps recognizing that the user experience of these pages was lackluster, Google offered users of its browser the option to change that. It’s a band-aid fix to an underlying problem, but it does work well on the client-side. As a site owner, I might not be so convinced, depending on how Chrome renders the site. If important CTAs or contact forms are relocated in manner that’s not optimal, it could impact conversion rates. It’s clear that Google has been incrementally pushing sites to provide a better experience. The mobile-first index is just the next step in a long series of steps to provide a better user experience. What’s the impact going to look like? It’s hard to say. This is a huge shift – it may be rolled out in phases like the two mobile-friendly algorithm updates were. The first phase may be less impactful to test the waters. Google’s John Mueller did state that mobile pages should have all the same features as desktop pages, which makes a strong case for a responsive site rather than dedicated m. sites or dynamic serving sites, but it’s impossible to know for sure. The mobile pages should be fully equivalent in content & functionality regardless of indexing, right? Why wait to fix that? Users care too. Despite the initial Fall 2016 announcement, Gary Ilyes has indicated the timeframe for release is now sometime in 2018. So there is time to make changes, not that Google has provided any formal criteria or us to follow. Will Google bias its own products and let AMP pages pass the test? Or will reduced functionality preclude them from ranking as well as responsive desktop pages? I’m curious to see how Google will accommodate these pages. We know very little, so it’s difficult to determine how this update will affect dynamic or dedicated m. sites, which seem to be the most at-risk. Responsive sites could see a negative impact, if mobile functionality or navigation isn’t consistent with desktop. Despite being the secondary index, desktop may play a larger role than mobile did. It would be smart for Google to weight the secondary desktop index heavier than it did the secondary mobile index, at least when the update initially rolls out. 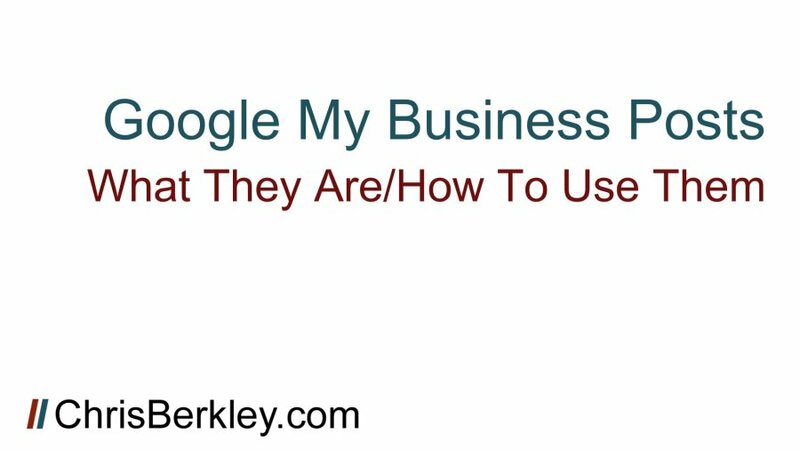 Google My Business Listings can drive a lot of organic traffic for businesses with a localized focus. Adding UTM tags to the website URLs within those listings is considered a best practice for optimizing GMB profiles. What Benefit Do UTM Tags Have? Adding UTM tags lets you differentiate between them and understand the impact local map packs may have. For example, if the local map pack was driving the majority of traffic, then you’d want to spend more time ensuring that you’ve optimized GMB profiles, citations, etc. in order to improve local map pack rankings. If the majority of traffic does not come from GMB listings, then it might be an early indicator that the site doesn’t rank well in those map packs, or it may be a sign that the map packs don’t play that big a role in a given industry. Only by determining where traffic is coming from can you determine where you need to focus your efforts the most. Adding UTM tags to 25 of a client’s Google My Business listings recently revealed some unexpected insights. More than 50% of organic traffic to those locations came through a Google My Business listing. We did not anticipate that much traffic coming from the listings. We estimated 20-30% as a generous estimate. Needless to say, this revealed a lot of revelations – improving the on-page optimizations would limit our ability to really drive results, unless we also focused on local SEO too. It’s also worth noting that in this particular vertical, it makes perfect sense that mobile has a higher percentage of traffic from GMB listings. In this particular industry, the locations are places you’d typically drive to shortly after finding the location. Source: g-local (subjective, you can pick what you want). Medium: organic (required – anything else will prevent the traffic from appearing in the organic channel report). If you’re tagging multiple listings at the enterprise level, the content and campaign categories are very helpful to identify specific locations and also regional markets. The client in this scenario operates in 8 regional markets with 25 locations spread across them. It’s also worth noting that it’s good to keep these as short and abbreviate whenever possible. 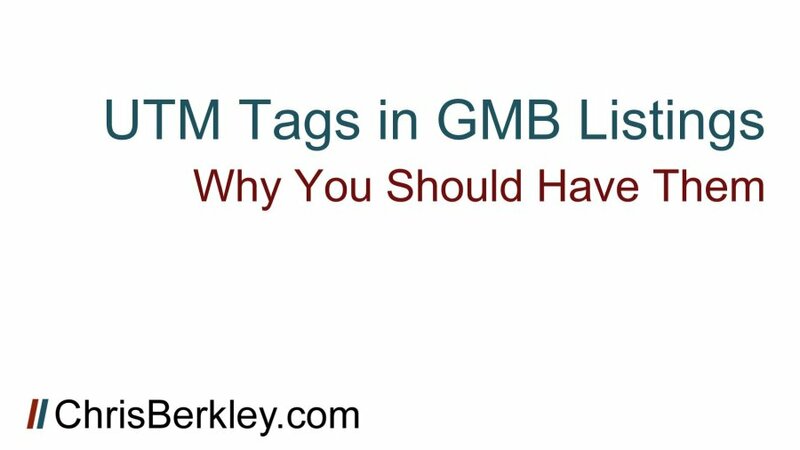 The GMB interface has a 256 character limit on URLs, so if your site’s URLs are long already, adding multiple UTM tag fields will push you past the limit very quickly. It’s definitely recommended to do this before starting any local SEO efforts, because this will give you a baseline for how much traffic comes through various listings before you optimize them. Measuring map pack rankings is all and well, but traffic is the real metric you should be measuring. Doing this will also let you determine how well GMB traffic converts and if it makes a difference compared to traffic from standard organic results. Questions? Tweet me @BerkleyBikes or comment here. 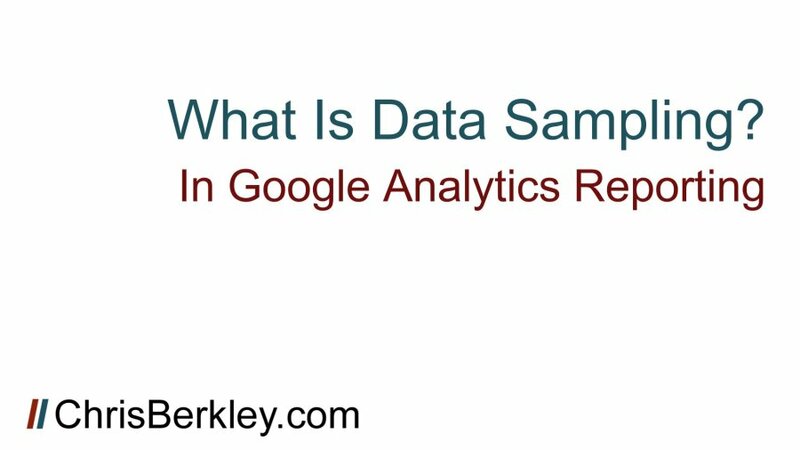 What Is Data Sampling in Google Analytics? Google Analytics lets you segment and filter data in hundreds of different ways. When you think about what GA does and how much granular data it logs, it’s downright astonishing. It’s even more astonishing that this data is readily available and can be viewed within the Google Analytics interface without needing to request custom reports. However, there is a limit to how much data can be processed. When you pull a large date range, or look at a busy month and try to segment by landing page, device, location, etc – you’re requesting Google Analytics to process hundreds of thousands of data points. When you consider that Google Analytics is deployed (for free) across millions of websites, it’s easy to see how the amount of processing power required could quickly spiral out of control. Instead of saying “report unavailable” or “too much data to process,” Google Analytics uses data sampling. It takes looks at a much smaller cross-section of the data and assumes it is an accurate sample of the entire dataset. Picture this: you want to know how much sleep you get in a year. Instead of tracking how much sleep you get every night for 365 days, you log how many hours you sleep in one week and multiply that by 52 weeks. The assumption is that the one week you track is a pretty typical week, representative of the way you sleep most of the time. That one week may not be representative of the way you sleep all year. Maybe you sleep more in the winter and less in the summer. Maybe your work schedule varies and that affects how much you sleep on a week-by-week basis. Sure, you could take a larger sample size – track 4 weeks and then multiple by 13 instead of 52. The larger the sample size, the more likely it is to be accurate. But it’s still not perfect because you’re making assumptions that those other 48 weeks follow the same pattern as the four you’re measuring. How Does Data Sampling Apply to Google Analytics and SEO? Tracking how much you sleep probably isn’t that critical, but when you’re making marketing decisions that cost tens or hundreds of thousands of dollars, you want to be sure you’re using accurate data. You can avoid data sampling, if you’re mindful of it and recognize when it’s happening. Google Analytics does let you know when the report you’re looking at is based on sampled data, but it’s very non-descript, located in the top right corner with nothing to draw your attention to it. “This report is based on 100% of sessions” indicates the data is not sampled. Anything lower than 100% is the percent of visits that the report is based on. The lower the number, the smaller sample size. How Much Does Data Sampling Skew The Numbers? Let’s look at some test cases. In both of them I used an Organic-only Google Analytics View, with a mobile traffic segment applied and a date range of 1 year (1/1/16 to 12/31/16). This is a very common setup, that allows you to report on metrics relevant to mobile device performance over a 1 year period. Monthly numbers were pulled in 1 data export for a 12 month date range. Monthly numbers were pulled in 12 data exports for 1 month date ranges. In this report we’re just looking at sessions (visits) for a high level overview. This is a very straightforward report – finding out how many visitors came to the site on mobile devices and trying to establish a month-by-month trend. The unsampled default report shows a total of 338,827 visits during this time period. After adding the mobile segment, the sampling rate was listed as 27.33% – meaning the sample size was only 27.33% of the total visits. The graphs below show the variance between the single data pull and the 12 data pulls. In this example, the sampled data is over-reporting by 0.99%. That may seem minor, but look at the individual months – the variation is much wider on a monthly-to-month basis – anywhere from -20.16% to +18.77%. More than half of the 12 months in the year were off by more than 10%. In this report we’re drilling down into goal conversions which are more important in many cases – these might represent actual customers or leads. The unsampled default report shows a total of 6,341 goal conversions during this time period and the sampling rate is still 27.33% because we haven’t changed the segment we’re using. In this case, the overall numbers are only slightly worse – over-reporting by 2.44% instead of 0.99%. However, the monthly variance is MUCH worse. Look at August: over-reporting by a whopping 39.04%! September and October aren’t much better, over-reporting by 28.97% and 25% respectively. Both of these reports are completely inaccurate and worthless for establishing seasonal patterns, or year-over-year performance by month. The only way to get accurate data is to use unsampled data, either with smaller date ranges, or using the API. Data sampling does not occur in default reports, but adding segments or filters will trigger sampling. It doesn’t necessarily matter what segments or filters are added – they could be based on landing pages, devices, mobile vs. desktop, etc. It also depends on how many sessions are within the date range. A site that gets 500,000 visits per month will encounter data sampling much sooner than a site that gets 50,000 hits a month. For one, use a smaller data range. Smaller date ranges reduce the number of visits, which reduces the likelihood of sampling. If you’re trying to look at a larger date range, exporting data in smaller batches is the way to go. This can be tedious if you’re trying to use the Google Analytics interface, which is why I recommend using the Google Analytics/Sheets API. The Google Analytics/Sheets API is incredibly easy to use and does actually reduce the sampling rate itself. It’s also much faster for exporting multiple datasets at once. You can also set up Google Analytics Views specific to certain data sets. Views exclude data before it even gets into the interface. The session limit is still the same, but when you add filters/segments, you’re doing so with a smaller amount of data points, so sampling doesn’t occur as quickly. I always set up an Organic-specific View so that I can look at organic data by itself – that helps avoid the session limit when segmenting landing pages by URL structure, for example. The last choice is to upgrade to Analytics 360. 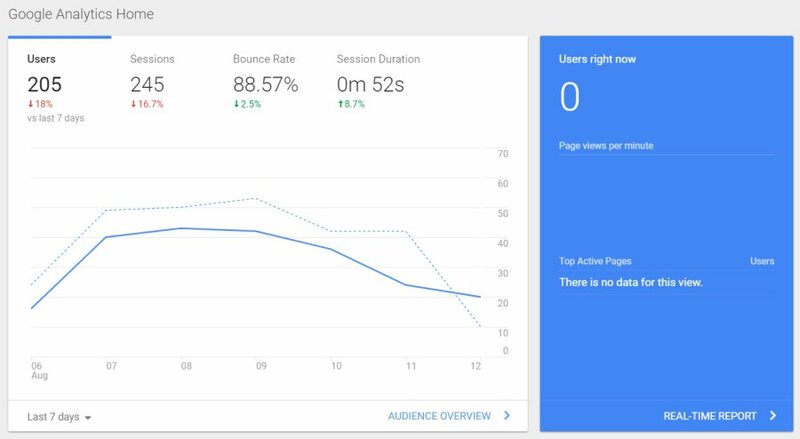 This is Google’s premium version of Standard Analytics, and lifts the sampling threshold from 500,000 sessions (at the property level) to 100 million sessions. It’s worth noting that Analytics 360 costs well over $100,000 – far outside the reach of many companies who aren’t big enough to afford it, but do get enough traffic for data sampling to be a common occurrence. Sampled data is not accurate data. Never use sampled data for reporting or analysis. Sampled data can be eliminated by choosing smaller date ranges, the Google Analytics/Sheets API. As always, tweet me @BerkleyBikes or comment here with questions.